This simple plugin provides ical export from the UCM system. This allows alerts and todo items from the UCM dashboard to appear in your personal Google Calendar or Outlook Calendar (or any calendar that supports importing ical url’s). 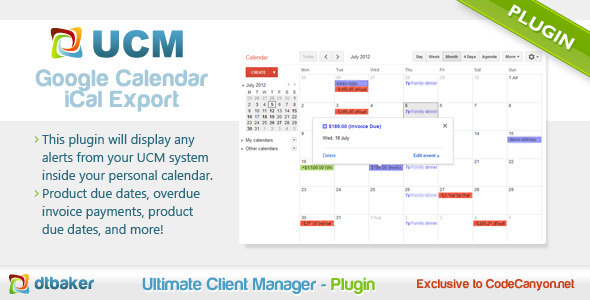 This also adds a calendar in your system which allows you to create tasks for your clients. Optional Features: Also install the UCM Finance Plugin to receive calendar entries for scheduled bill payments, overdue invoices and more. Please click here to access support & documentation.